Early Warning... 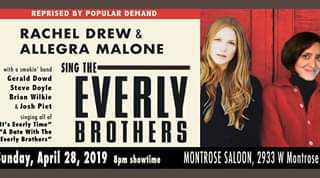 This will be reprised by popular demand (particularly Uncle Ron & Aunt Pam's): Rachel Drew & Allegra Malone sing The Everly Brothers at MONTROSE SALOON with a hot smokin' band. Steve Doyle on electric guitar, Brian Wilkie on acoustic guitar, Josh Piet on bass, and Gerald Dowd will be adding his percussive majesty this time. We will perform all of "It's Everly Time" and "A Date With The Everly Brothers." Bring yourselves, your honeys, and your hats! Music starts at 8.